BARBARA A. OLS (nee Beebe), dearly loved mother of Harold "Bud" (Lynn) Ols and Karen (Christopher) Stormann; cherished nanny of grandson Rocco Stormann; loving sister of Robert (Mary Ellen) Beebe and Beverly (James) Sherwin. 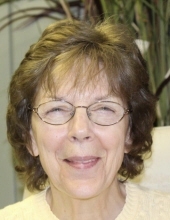 Barbara died Feb. 8, 2019. Mass of Christian Burial Tuesday Feb. 12 at 10:30 AM at Ss. Robert & William Parish, 367 East 260 St., Euclid, where family will receive friends 1 hour prior to Mass in the church gathering area. Per Barbara's request, there will be no viewing and burial will be private. In memory of Barbara, please consider a donation to Rainbow Babies and Children's Neonatal and Pediatric Intensive Care Units. "Email Address" would like to share the life celebration of BARBARA A. OLS. Click on the "link" to go to share a favorite memory or leave a condolence message for the family.